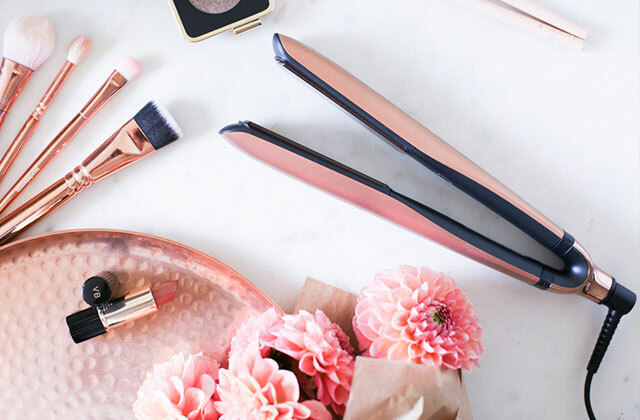 There are a few things that make this product an exceptional choice but the biggest selling point is, without a doubt, the ComfortCut blade system. Utilising a set of rounded edges, the model ensures super smooth and safe shaving without any cuts and irritations. The plastic cap is somewhat flimsy. The Philips Series 3000 electric shaver will make your routine shaving comfortable and your skin will be as smooth as possible. The device is capable of operating for almost an hour from a single charge. 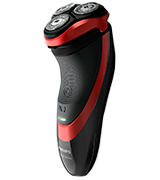 But if you are in a hurry and the battery is low, you can use the quick 5-minute charge for a single shave. A charging stand allows for a compact vertical positioning of the shaver to save precious space in small bathrooms. Sideburns trimmer is not included. A simple yet durable shaver will offer you the whole variety of features for your comfort and optimum shaving results. Designed for use in the shower, it is an affordable and functional model for busy men. Shower, shave and go! The included USB-cable enables the use of this shaver anywhere and anytime. Ideal for frequent travellers and active men. The trimmer blades aren't as sharp as on some other shavers in the review. The SweetLF SWS7105 is a budget-option that has all the important features of more expensive shavers. It has a waterproof sealed body, making it possible to use it in the shower and bath, and features nicely-polished rotating heads for clean and close shaves without cuts. 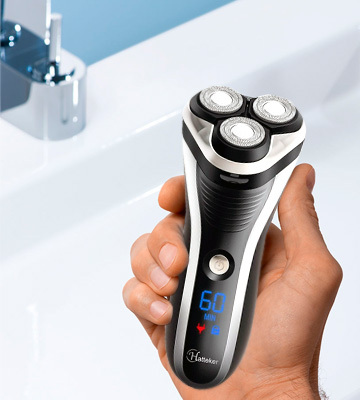 The speed of the built-in motor is 2800 RPM - this power is more than enough for high-quality and fast shaving, and can easily trim thick stubble. 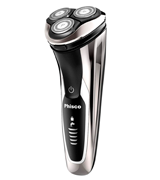 The Phisco rotary razor with a movable cutting unit follows the contours of the face and neck exactly. Effective to use with both wet and dry shaving. In addition, it is very convenient to use the device, thanks to the ergonomic handle and informative display. The battery charge indicator shows the percentage of battery charge left, meaning that you will always be aware of when it needs to be recharged. The Hatteker is a practical men's electric shaver with a waterproof case that will give you a smooth shave without skin irritation. The device includes a retractable trimmer for trimming mustache, beard and sideburns, as well as a brush and storage bag. 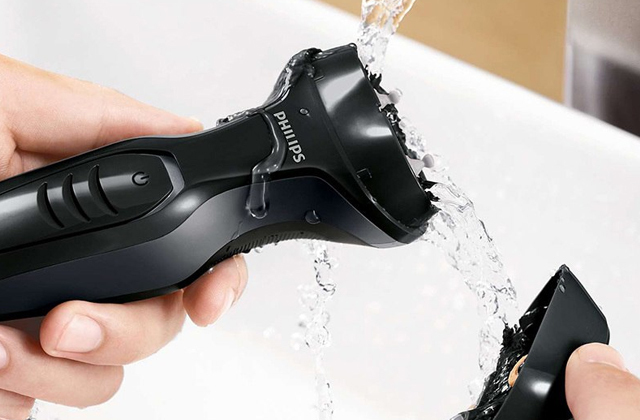 The Philips s3580 06 rotary shaver looks very stylish and its handle feels pleasant to touch. Two things customers find especially appealing about this model are its quiet operation and a battery that can last up to 50 minutes on one full charge, providing you with 17 shaves. Thanks to the rounded design, the Philips s3580 06 ensures safe and smooth gliding. The flexible heads move in 4 directions, independently from each other, and adjust to the contours of your face, neck and sideburns. The Philips rotary shaver is suitable for both wet and dry shaving and you can even use it in the shower, thanks to the AquaTec seal. 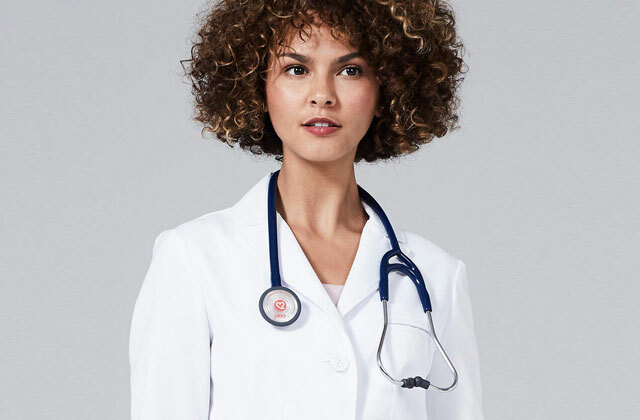 The featured ComfortCut Blade System is essential when it comes to comfort: it prevents your facial skin from irritation and cuts. Plus, the Philips s3580 06 comes with a pop-up trimmer which enables beard shaping allowing you to add a finishing touch to your look. 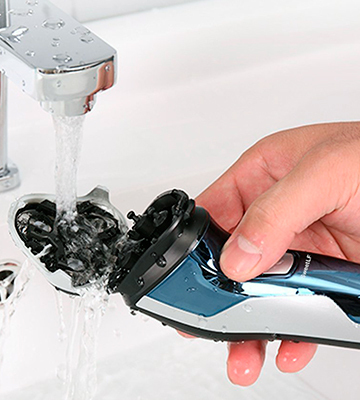 Featuring water protection, this rotary shaver is easy to maintain: just open the heads and clean them under running water. Such simple care will let you prolong the service life of your device and save you from the need to purchase replaceable parts for a long time. 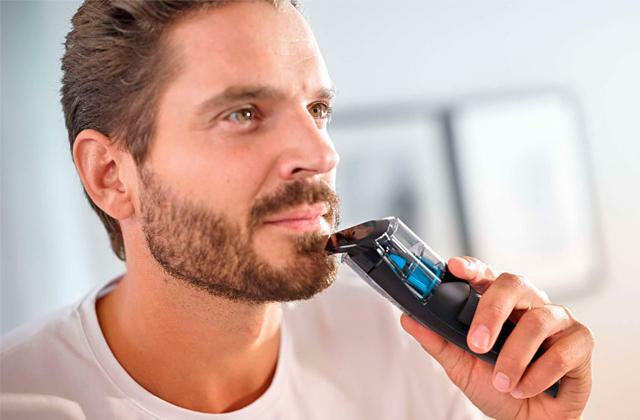 Summarising, if you're looking for a high-quality electric shaver that will serve you for years to come, then it's well worth it to invest in the Philips s3580 06 which will pay you off with exceptional comfort, reliable performance, and long years of flawless service life. 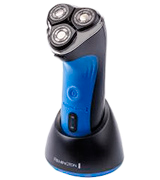 This Remington rotary shaver offers the whole bunch of functions initially designed for your comfort and convenience. The first thing you will surely benefit from is three floating heads for more flexible and efficient shaving. A dual row of blades will not miss any hair and cope even with a stubborn stubble without any skin irritations. To charge your shaver you only need to put it into a charging stand and a battery indicator will show the battery charge. A waterproof body and shaving heads make cleaning a breeze while a cleaning brush will help remove small hairs stuck in the blades. A travel pouch will become a real catch for business trips and long-distance travels even without access to the electric mains since a full battery charge is enough for 60 minutes of shaving. 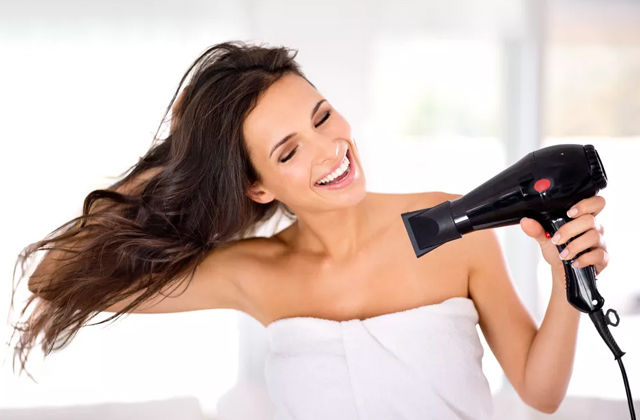 At the same time, automatic voltage adjustment feature allows for a hassle-free shaver operation at any corner of the world provided that there is an electric socket. The only item not included in the set is a beard and sideburns trimmer. As for the rest, the Remington AQ7 will impress you with its long-lasting performance and fit all your shaving needs. 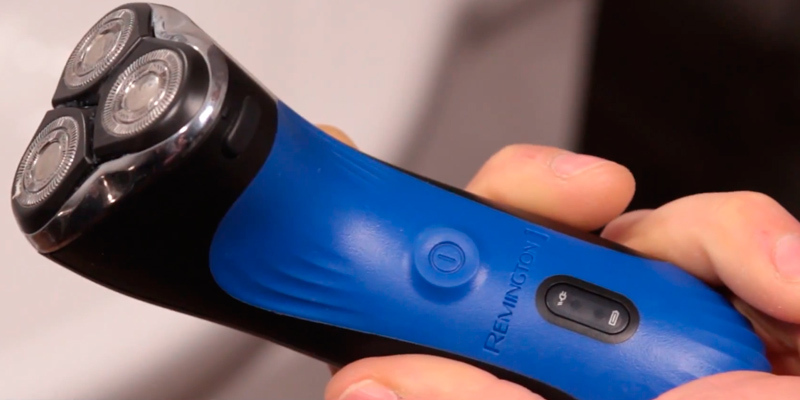 Using Remington for wet or dry shaving you can forget about discomfort and be sure that this model will serve you for years. 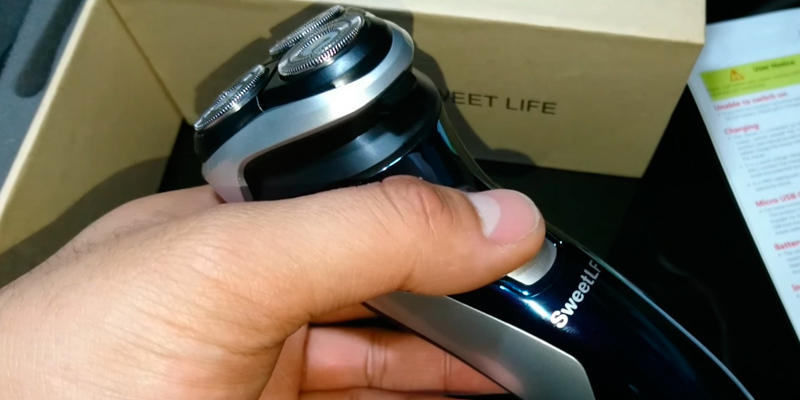 Although cheaper than the other models we reviewed here, the SweetLF electric shaver doesn't trail behind its more expensive peers. With three rotating floats and a powerful motor, it's definitely one of the best electric shavers in its class. 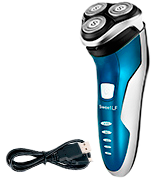 The SweetLF SWS7105 is a rotary type of electric shaver. It has three 360 floating heads which adapt to the contours of neck, jaw, and face for a close and comfortable shaving experience. Also, it has a pop-up trimmer for accurate trimming of sideburns and facial hair and a blue-lit LED display showing the battery charge. 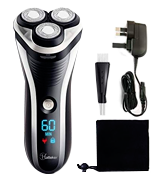 One of the benefits of this shaver over some other models is that it has a USB port, meaning it can be charged through any USB charger, even that of your cell phone. 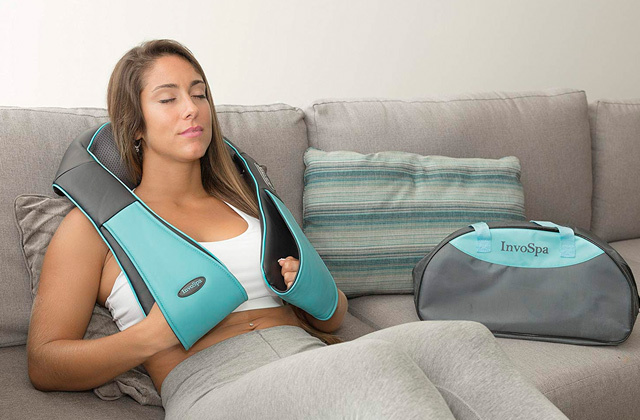 This adds up to its convenience of use and portability. Another advantage of the SweetLF SWS7105 is that it's waterproof, which allows you to clean it under tap water and use it in the shower for a more comfortable shaving experience. To clean the unit, the head of the shaver pops up so you can access the inside of it and brush off leftover hair. All in all, while we wouldn't go that far calling this shaver the best electric razor, it's certainly not a bad choice in its price range, especially if you're somewhat budget-strapped and need an inexpensive thing. The SweetLF SWS7105 has all the necessary features, is comfortable to grip and use, and universal-voltage. You can use it wet and dry and take with you on your trips without worries. 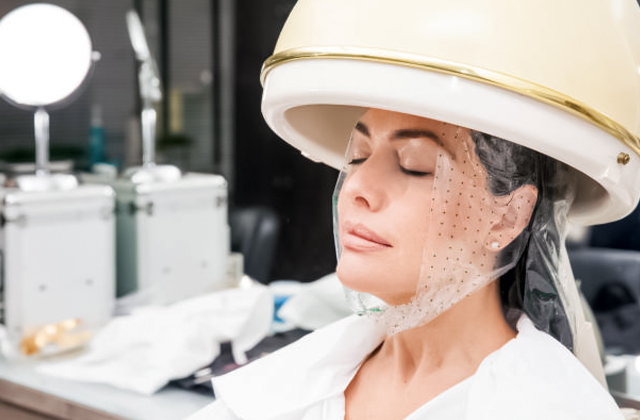 One of the problems associated with using an electric shaver is that the process tends to be a bit noisy. This is natural, of course, as almost any device that uses high-speed moving parts will tend to generate a lot of noise. If this is something that annoys you, then fear not - we have the perfect rotary electric shaver for you. 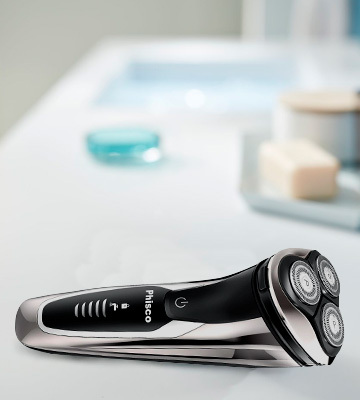 The Phisco IPX7 Electric Shaver Mens operates very quietly, making your morning shave much less noisy and more pleasant. 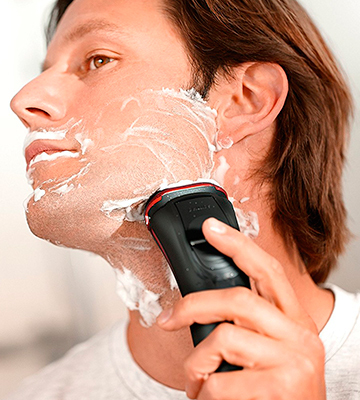 This men's electric rotary shaver may be quiet, but it doesn't have to sacrifice power in order to achieve this. The 2800RPM electric rotary motor is powerful enough to easily and efficiently cut through the toughest stubble, leaving your face feeling fresh and clean and providing a close and comfortable shave. 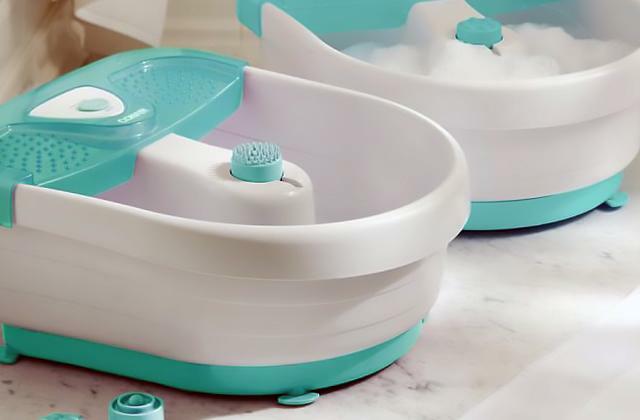 The IPX7 Waterproof System used for the construction of this device means you can use it in both wet and dry conditions, as well as making it fully washable under the tap. The device does take an hour to fully charge, but thankfully it also includes a 1 minute fast USB charging mode that lets you quickly charge it with enough power for one shave. 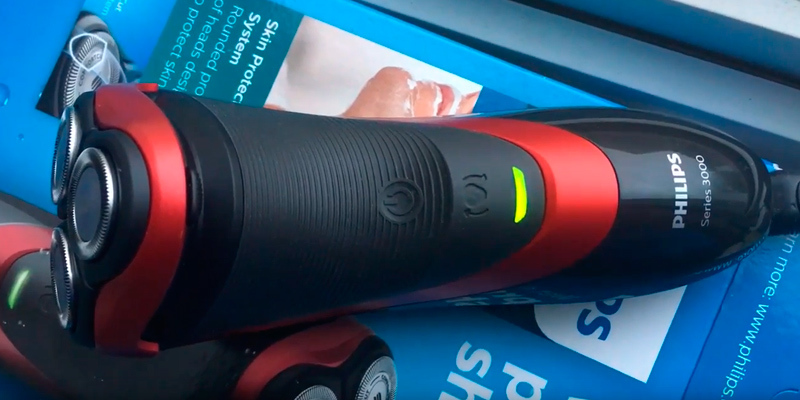 The included pop-up trimmer and smart travel lock add extra usability and convenience, making this a great rotary electric shaver that everyone will love. Most rotary electric shavers aren't known for being the most convenient or comfortable shavers to use. They can be especially troublesome when trying to use on the contours of your face, often leaving patches of hair as well as providing an overall uneven shave. 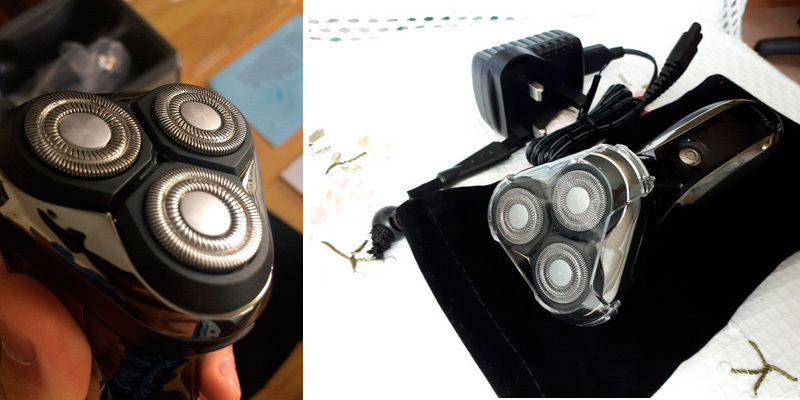 This problem has plagued rotary shavers for a long time, but that time is now relegated to the past, thanks to the Hatteker Mens Electric Shaver. This shaver includes an advanced floating head that allows for the razor to move across your face freely, providing a close and smooth shave even in the most uneven areas of your face. What's more, the shave is quite comfortable, and provides no irritation of the skin, making it great for those who have sensitive skin. This shaver is fully waterproof, making it ideal for use in both wet and dry conditions, and also making it easy to clean with water. The LCD display on the device shows the remaining percentage of battery power, so you should never be caught unaware of the shaver being low on power. 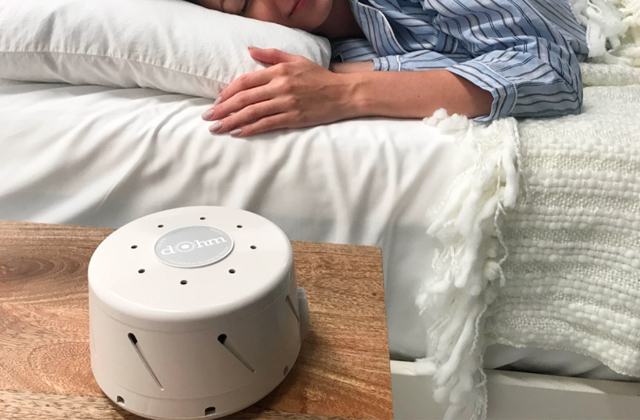 The device provides a full hour of shaving time with a 90-minute recharge, meaning that you can easily use it for multiple days before needing to recharge it. Overall, this excellent electric shaver will provide anyone with a smooth and comfortable shave. A lot of men have long given their preference to electric shavers. 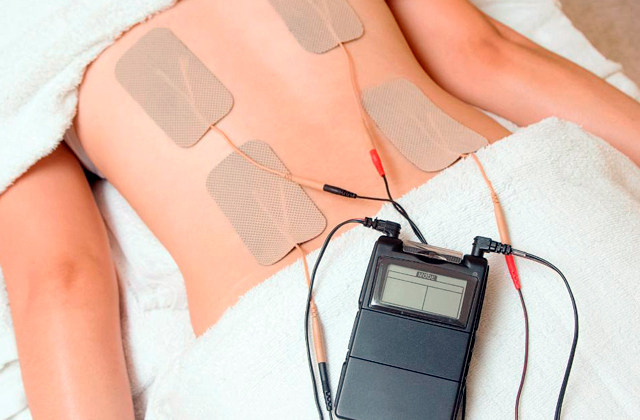 These devices are much more comfortable and reliable than a conventional razor. Using an electric shaver, there is no risk of getting cuts. Rotary electric shavers with floating shaving elements provide a more thorough shaving, since you can easily shave even the hard-to-reach places. 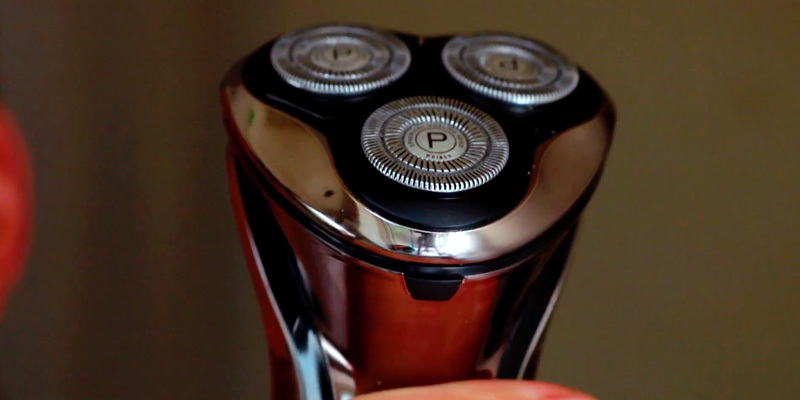 Owing to the floating heads, a rotary shaver provides quick and quality shaving in just one movement. Thus, if you do not want to sacrifice the quality of shaving, your choice is a rotary razor. Looking for a shaver, you should choose the way of shaving: dry or wet. Now, the versatile models with the function of wet/dry shaving are in great demand. The wet feature means you can wash the razor under running water, and also you can safely shave while taking a shower. Models, designed for wet shaving, are easier to clean and can be stored in a bathroom in spite of high humidity. In recent years, choosing a really good shaver has become quite a challenge. 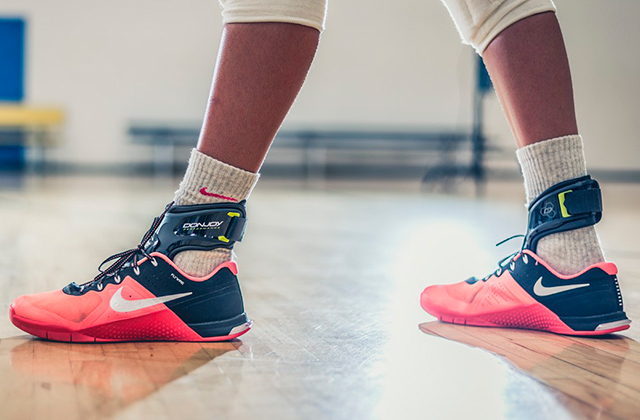 Every year, more and more new models are “thrown” on the market. It is important that you can differ some real innovations from a simple marketing ploy. In our review, we will try to help you with the choice. We have considered both inexpensive electric razors and those of premium class. There are both razors for adult men with stiff bristles, and models that can be given to a teenager as a first razor. If you have a beard or a moustache, a beard trimmer is a tool you need. Meanwhile, nose and ear trimmers will help you to get rid of unwanted hairs in hard-to-reach areas, allowing you to finish your perfect look. 1. Lindsey Fitzharris The Bloody History Behind the Barber’s Pole, The Huffington Post. September 1, 2013. 2. How to Shave With an Electric Shaver, wikiHow. 3. 12 Facts You Never Knew About Shaving, BuzzFeed. September 5, 2013. 5. Electric razor, Wikipedia. September 6, 2016. 6. A Complete Guide To Buying An Electric Shaver, GroomNStyle. May 29, 2016. 7. THE 5 RULES OF ELECTRIC SHAVING YOU NEED TO KNOW, Men's Health. February 15, 2016.